Enjoy the following steps to guide you through the kidney detox and safely and effectively eliminate waste in the kidney and gallbladder. The most important reason for doing a kidney cleanse in the full body detox is because it softens gallstones, easing the passage of stones. This is also why you always want to do the kidney detox before the liver detox! Below are products needed, plus check out what other's experienced on the kidney cleanse and their frequently asked questions! 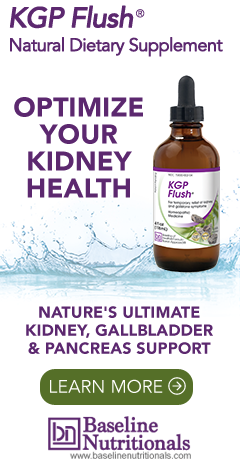 Baseline Nutritionals® now carries a version of this formula under the name KGP Flush™. Or, if you would like to save, you can purchase the entire Liver Detox Kit with KGP Flush™ included! If using with the liver detox, make sure you do the kidney detox within 30 days before Phase III: the 5-day Liver/Gallbladder Flush & Blood Cleanse. I have CKD 3-4, GFR 22-24%, creatinine 2.3. No pain, no swelling, no symptoms except UTI's and leg cramps at night. My diet is plant based, mostly raw: freshly-made raw juices, smoothies, salads, raw green blender soups. I am diabetic 2, current blood sugar is 125, A1C was 5.4 six months ago. My nephrologist only monitors me with lab tests. He does not know about herbs, does not approve of them. I would like to know if I should try your detox formula. Hi, thank you for a great resource. I was wondering, how long after the colon cleanse is it okay to proceed to the kidney cleanse? I was thinking of allowing 1-2 weeks from completing the colon cleanse to give my body some recuperation time and not overdo things. Is that about right? Many thanks. You can start the next day, no delay necessary. But if you want to wait, that is fine too, just be sure to do the kidney and liver detoxes closer together. I have a fatty liver and polyps on my gallbladder, would this be ok to use or would you suggest something else? For obvious legal reasons, we can not diagnose or prescribe. That said, we have had others use this successfully, but be sure to work with your doctor.